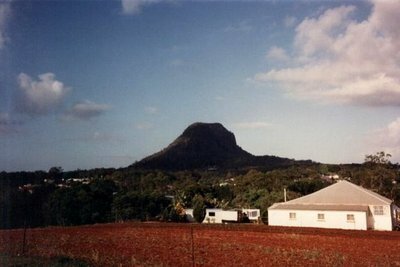 From a distance, Mount Cooroora seems to touch the sky. Take the Pomona exit 166 kilometres North of Brisbane on the Bruce Highway and be transported to what seems like a far away land. Pomona- declared 'The Friendliest town in Australia' is nestled at the foot of Mount Cooroora and is abundant with easy walking tracks and parks and if you dare to challenge your fitness levels, you can trek the mountain to indulge in the views from the summit. The sun belted down upon my sweaty face as I stopped for a break, leaning against a small Gum tree and marvelled at the view from only half way to the peak. My legs were weak and shaky, but there was no denying the climb was proving to be worth it. And I knew that a fabulous array of cafes awaited my return at the foot of the mountain to fill my grumbling stomach and wet my cotton dry throat. Plenty of children were joining their parents on the steep walk as well as the elderly, but keep in mind the journey to the top is challenging so do not attempt the climb unless you are quite fit. The final view from the peak is truly breathtaking and you will be thankful you made it. The Glasshouse mountains tower above the farmlands and the ocean sparkles in the distance. The summit is alive with climbers snapping pictures and the odd artists, perked on a rock recording the sight in detail with pencil. I capture a few happy snaps of myself with the spectacular view in the background before commencing the descent. Back down in the country town of Pomona, the Pomona Hotel is the perfect place to quench your thirst with a cold beverage and with plenty of food to offer, it is also a great choice for lunch. The 14ft ceilings and wrap around balcony and verandah areas make you feel as though you are playing part in the famous Country number 'A Home Amongst The Gum Trees' – I expected to witness John Williamson appear from behind the bar somewhere with his guitar. If 'funky' is more your thing, there's no place better than Lozza's Rock'n'Roll cafe, the home of 60s style meals, thirteen different flavours of thick shakes, milkshakes and spiders, booth seating and ready for it? A dance floor. Yes, that's right! After you have satisfied your hunger you can get up and jive to the best of the 60s rock. Maybe you are a movie buff and thrive on the history of theatre? Look no further than the gorgeous Majestic Theatre oozing with character where you step back in time to silent cinema. Recently refurbished the theatre operates as a great entertainment venue, available for bookings for your corporate events, wedding and birthday celebrations as well as screenings of silent films. A strenuous climb with rewarding views, an ice cold beer complimented by a delicious burger certainly and a trip down memory lane with the majestic theatre, certainly makes Pomona one of North's Brisbane's best kept secrets and a fantastic weekend out. If fitness is a huge part of your life, you will be thrilled to learn that this relaxed town hosts the yearly 'King Of The Mountain' race, held on the fourth Sunday of July. The event has been running for 32 years and is the time of year the population of Pomona swells ten fold. The festival is packed with activities as well as the famous race and it run and organised completely by volunteers. You can get involved and volunteer and become a part of this wonderful fun day by visiting the 'King Of The Mountain' website. I think I will be sticking to the burgers, and leave the big race to the kings. Where's the Best Place to Jet Ski in Brisbane?